Extra Shiny Chocolate Ganache - Let the Baking Begin! Chocolate Ganache is a mixture of cream and chocolate which is often used to decorate cakes, cupcakes, muffins, eclairs and other desserts. It adds a very beautiful touch, making any dessert look professionally done, even though the efforts it takes to make are minimal. This ganache has a secret ingredient to make it ganache SHINY. Check this White Chocolate Ganache Frosting, if you’re looking for ganache made with White Chocolate. Heat the ganache slightly (no higher than 110F), then add EXTRA 2 tablespoons of chocolate chips or chopped chocolate, for every 1/2 cup of chocolate chips used in the recipe, let sit for a couple of minutes, then stir until smooth. Sometimes the chocolate cocoa content is low and that leads to thinner ganache. One of the most common problems with ganache is that it goes from shiny to dull, once refrigerated. This recipe is here to fix this problem. How to make SHINY GANACHE? The secret to making the ganache extra shiny is to add corn syrup. 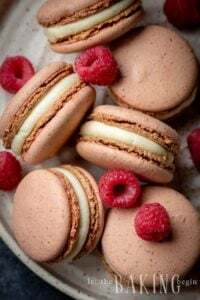 Glucose syrup (get it HERE *affiliate*) is even better for this purpose, but it is hard to find in stores, so corn syrup will do if that is all you have. The corn syrup is the key ingredient that gives it the extra gloss and keeps the ganache shiny even after being refrigerated. SCROLL TO THE BOTTOM to see the VIDEO on how you can DECORATE A CAKE with this CHOCOLATE GANACHE. What will YOU use this recipe of Extra Glossy Chocolate Ganache for? Combine the hot cream, chocolate chips and corn syrup or glucose. Let sit, then stir until smooth. You can do this with both chocolate chips and good quality bar chocolate (I use Trader Joe’s Dark Chocolate Bars). Bring ganache to room temperature before pouring over cakes. You can set the cup with the warm ganache over cold water to cool it faster. If the ganache thickens too much, that it is hard to pour, just heat it in a couple second intervals in the microwave to make it pourable. 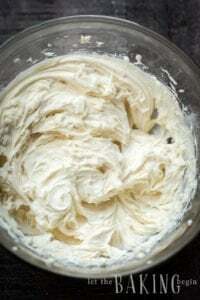 Creamy Sour Cream Frosting – Creamy and tangy frosting used for different desserts. Vanilla Cream Cheese Buttercream – A classic buttercream with vanilla. 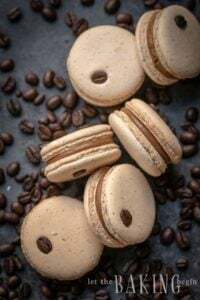 Dulce De Leche Mousseline Creme – Delicious pastry cream with dulce de leche. 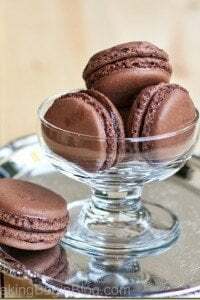 Extra Glossy Chocolate Ganache (Glaze) - learn how to make this simple and easy chocolate decoration with all the tips and tricks you need for success. Heat cream until very hot, or almost boiling and add chocolate chips. Let sit for 2-3 minutes to allow the chocolate to melt. Stir with a whisk or a spoon until glossy and homogeneous. Add corn syrup or glucose & stir until it’s well incorporated into the chocolate & smooth. Place the bowl or cup with ganache into another bowl or cup filled with cold water. Stir the chocolate slowly allowing it to cool to room temperature, or until it’s thick enough that it will form a drizzle when poured down the inside of the cup (about 10 minutes). 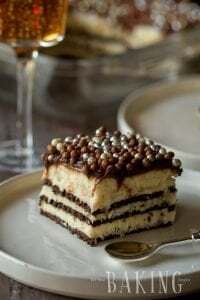 General rule for making ganache that is to be used for drizzles on cakes, cupcakes and such is to use 1:1 ratio of liquid fat (cream or butter) to chocolate. We are using some corn syrup, that's why we're using slightly less cream. I made a similar Nutella ganache and it stayed shiny … https://pin.it/mhwyfppvx6jn54 … for hours, but the next day the gloss was gone. Is there an amount of corn syrup I might add to main that shine? It was glorious! Thank you for sharing this secret. I am a beginner in this field, so I don’t have more knowledge about this stuff. Next time while making a cake, I must use your recipe to make my ganache more shiner. Thank you Panna and good luck! Will this ganache remain glossy even when we refrigerate the cake after glazing it? Hi Riana, this ganache is glossier than the regular ganache made without the corn syrup, but if you want something super glossy (bakery style glazed cakes) I would try this Dark Chocolate Glaze from Truffle Cake. Hi I’m from the UK can which measures in metric rather than cups! Could I have the measurements in grams and mls mls please! Quick Ricotta Doughnuts - Let the Baking Begin! Let the Baking Begin! Pistachio-Walnut Baklava Rolls - Let the Baking Begin! Let the Baking Begin! Chocolate Cake with Plums, Walnuts and Sour Cream Frosting - Let the Baking Begin! Let the Baking Begin! Hi. I have tried different recipes of chocolate ganache but they all crack in the fridge. But i’ve never tried one with corn syrup – Will corn syrup prevent it from cracking? Hi Olesya, if it cracks usually that means that the ganache is a little too thick. Make it thinner by adding a tad of heavy cream to your ganache. Or it can also be that the cake surface is absorbing all moisture from the ganache and then it can also crack. For this, make sure the cake is covered with either buttercream or even a thin layer of preserves. I always make my ganache with corn syrup or glucose so I am not sure if it will help, but I guess you can try it with syrup or just thin it as I mentioned above to solve the problem. Chocolate Roll with Walnuts & Dulce de Leche Buttercream Let the Baking Begin! 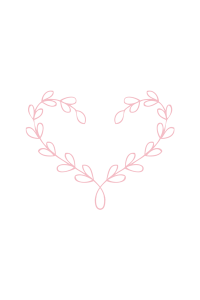 appx. how much is 100 ml of heavy cream in cups or tablespoons? You should use a liquid measuring cup for this, but it’s a little less than half a cup. 1/2 of semi-sweet, 1/2 a cup? Half of what? Yes, it’s half a cup, thanks for catching that! I don’t have corn syrup or glucose. Will it still work?